Searching for info on a poorly understood ancestor sometimes has elements of jig saw puzzle assembly and crime scene investigation. One small clue leads to another. The pieces don't fit, so you try another approach, and another name or connection emerges. And with a little luck it finally begins to make sense. So it has been with my GGG Grandparents, William and Catharine (Kimbrel) Walker. While there are still some missing pieces, I can now follow the highlights of their lives, and see them as real persons. William was born in 1790. In the 1850 census he said he was born in South Carolina, which is now supported (see notes with his father). However by 1795 his family had moved to Surry County, NC. This part of old Surry is now Yadkin County, and his family lived a few miles southwest of Yadkinville. His parents enrolled him into membership of Surry County's Deep Creek Monthly Meeting of the Quaker church in 1799. This church is still active in Yadkinville. His first wife, Catharine Kimbrel, was also born in 1790, probably in the same area. They were married by 1818 (and William was "disowned" by the Quakers on 5 Sep 1818, because Catharine was NOT Quaker!). In the 1820 census they have two sons. The second of these is our ancestor Bartlett Yancy WALKER. William farmed adjacent to his father and brother Richard. In 1824 father Robert had 800 acres, brother Richard had 427 acres, and William had 468 acres. By 1830 they are still in North Carolina, and have four sons and four daughters. A fifth daughter is born in 1831, and a sixth daughter in 1833, bringing the total to 10 children. Then, sometime between 1833 and 1835, they move from North Carolina to Henry County, Indiana. William's brother Richard, and his family, also moved at the same time. It is also believed that other siblings (Robert, Jamina and Anne) also ended up in Indiana at about this time. Catharine died in August 1835. And their 12-year-old daughter Nancy, died the following month. William then married a "Rachel Kimbill" (name probably really Rachel Kimbrel) in 1837. While there is some question, I believe Rachel was probably Catharine's younger sister. In addition to losing his first wife, five of William's six daughters died before William. While we don't know the causes of death, the suspects include childbirth, cholera, and/or typhoid. William died in 1855. Rachel survived until 1890, when she died at the age of 90. I started knowing only that ancestor Bartlett Yancy WALKER had married Frances Nixon MAXEY, and that he claimed to have been born in Surry County, North Carolina, in about 1819. Next I turned to the census records for Surry Co., and after much work was able to construct a plausible scenario of family relationships based on the Walker families living in the area and their proximity to each other. Over time, this assessment was further verified by Quaker Church records and land records. William first appears on his own as head of household in the 1820 census for Surry County. However the people count from this census is confusing - - there seem to be two adult couples, I suspect maybe a married brother or sister, and spouse, are sharing the household. There are two males under age 10, one of who must be William's son (our ancestor) Bartlett Yancy. The Surry County tax records for 1824 tell us a lot. William is living very close to his father and brother Richard – it appears that his father has been dividing his land holdings among his sons. William has 468 acres with a value of $800, pays a poll tax for one person, and has no slaves. William is also in the 1830 North Carolina census, with the people count making more sense (there are no extra adults). In 1830 he has added two new sons (bringing the total to four) and four new daughters. In 1830 he is still living very near father Robert and brother Richard. There are 26 people living in the 3 households. THE MOVE TO INDIANA: William disappeared from North Carolina before the next census in 1840. However the knowledge that his brother moved to Henry County, Indiana, led me to search there for further clues. It took a while for all the pieces to fit together, but I'm now convinced that William made the same move some time between 1833 and 1835. I believe his brother Robert III was the westward pioneer of the family. Some of his descendants report that he had children in Tennessee in 1823 and 1825, and then settled in Wayne County (adjacent to Henry County) no later than 1828. QUOTE (from www.hcgs.net): �This old burial ground out in the middle of a corn field on the Charles Gillespie farm, in section #34 on CR #25E, just south of the old RR bed, was the burial ground for the William Walker family in the 1830s. Sometime in the 1990s the landowner took the markers from the field and placed them in his front yard so he could quit plowing around them. He told me "at least they are still on the old homeland." Walker, Nancy C.; Death 20 Sep 1835; Age 12y, 11m, 1d; D of Wm. & Catharine"
INDIANA MARRIAGE RECORDS: Online source from Family History Library in Salt Lake City, OS Page 0874489 Item 2: "Rachel Kimbill" is reported as marrying William Walker on 24 November 1837 in Henry County, Indiana. Now, I have chased two theories about his new wife Rachel. One was that she was a widow, and that she brought two children from her previous marriage into William's household. "Kimbrel" could have been either her maiden name, or her married name. I can't yet absolutely disprove that theory. But I have another theory that I like better, and for the moment I will go with it. I think that Rachel was Catherine's sister, and that she had never been married before. Further, William and Catherine had a daughter in about 1833, and I believe Catherine named the new daughter "Rachel Catherine" after her sister and herself. Catherine became ill and died in 1835, leaving William with lots of kids still at home – and five of them were under the age of 10. That would be a very tough situation for a man who needed to tend to his farm. I suspect Catherine's sister Rachel came from North Carolina to rescue William and his young children. William fell in love with Rachel, and they got married and had a son named Louis. Why am I jumping ahead to the 1900 census? Because son Louis/Lewis was found there, and reports he was born in March 1838. This is the most precise date found. It suggests his age in the 1850 census (see below) was misreported, that he was age 12, not age 13. THE 1840 CENSUS, FRANKLIN TWP., HENRY CO., INDIANA: Both William and his brother Richard (see previous notes) are found in this county. This 1840 census shows there's an adult female in the house between age 40 and 50, and that would be his new wife Rachel. There are also two new young children, a male and a female. They would be Rachel C. and Louis W. (the names will be learned in the next census). "Neighbors" can also be important in understanding a census. The 1840 William Walker is living next door to a Joseph Kimbrel, and William�s first wife was Catharine Kimbrel. Since Kimbrel is a rather uncommon name, this is probably not coincidence. Joseph is likely Catharine�s younger brother, or perhaps a nephew, who moved to Indiana along with the Walkers? Land records show Joseph Kimbrel owned his land in 1832, and William Walker bought the adjacent farm in 1836. But surely William lived there earlier, possibly as a tenant? The 1835 graves on the land clearly show he had a home there before 1836. The count of William's children in 1840 showed that our ancestor, Bartlett Yancy, had already moved on. I still don't know where B.Y. went in 1840, perhaps he was working nearby as a farm laborer? We do know that he married in 1845, and is next found in Illinois in 1850 living near his wife's parents. 1850 CENSUS, FRANKLIN TOWNSHIP, HENRY COUNTY, IN: There are still many Walkers and Kimbrels in the county, and a William Walker with a perfect fit is still there. The �Joseph Kimbrel� mentioned in the 1840 census is only one page over. The 1850 census finally gives us all the names and exact ages, and this William is age 60 and exactly consistent with the one we want. And his wife's name is Rachel, and she was born in North Carolina. The ages and names of his remaining at-home children are consistent with the count from the 1840 numbers -- we have Rachel C age 17, and Louis W. age 13. The ages of the children imply that Rachel C. was born in 1833 and Louis W. was born in 1837 (really 1838), with Catharine's death between those dates. The child Rachel C. was born in North Carolina, and if she is indeed Catherine's daughter then the family must therefore have moved to Indiana after 1733. If Lewis (born in Indiana) was born in 1838, he is too young to be Catharine's son. William and Rachel were married in 1837, so Lewis is almost certainly THEIR son. Census says Rachel cannot read or write, but William can. William says his farm is worth $2500. Her tombstone (see later) says she was born in 1799. In the 1840 census she is reported as age 40-50, and that is plausible. However in 1850 she reported age 45, but she was really 50. In 1860 she reported age 64, but she was really 60. In 1870 she reported age 76, but she was really 70. In 1880 they got it about right and reported age 80.
WHO IS "AMA ANDERSON"? WHO ARE VALINDA AND DELANA? MORE 1850 CENSUS QUESTIONS: The 1850 census also shows a 2-year-old female �Ama Anderson� living in the William Walker house. There is also a very large Anderson family living very near by. Further, a later probate document shows that William's heirs included Ama, Valinda, and Delana Anderson. All of these people come together in the 1850 census, so I will introduce them here. I had to dig through a LOT of sources to piece this together. Pay close attention - - this is complicated! On 14 April 1843 one Nelson Anderson married Mary Ann Walker, one of William Walker's daughters. They had two children, Valinda and Delana. And then Mary Ann died on 10 Jun 1848. Meanwhile, Nelson's younger brother Terrel married Rebecca D. Walker, another daughter of William, on 9 Sept 1847. Terrel and Rebecca had a daughter, Ama (name may be Amy? Or Anna? ), who was born in 1848-1849. Rebecca then died on 10 Mar 1849 (maybe from childbirth?). Her grandparents, William and Rachel Walker, took in Ama, presumably because Terrel could not cope with an infant daughter by himself. Meanwhile, another nearby neighbor, Wiley Spaw, married Nancy Burger on 13 Oct 1836. Their children were Enos, Margaret, Elizabeth, George, and Darius. Wiley then died on 14 Sept 1847. Then on 27 Mar 1849 the above widower Nelson Anderson married the above widow Nancy Jane (Burger) Spaw. THEIR daughter, Charlotte, was born 9 Mar 1850. And also, sometime before 1850, Nelson's brother Terrel also found a new wife, Margaret Custard, and they married on 20 May 1850. SO IN THE 1850 CENSUS, the Anderson household consists of Nelson and wife Nancy; HIS daughters Valinda and Delana; HER children Enos, Margaret, Elizabeth, George and Darius; THEIR baby daughter Charlotte; Nelson's brother Terrel; and Terrel's new wife Margaret. Terrel's daughter Ama is living next door with the Walkers. Also at the Walker household, William is with his second wife Rachel (who was probably the sister of his first wife Catherine). Also in the Walker household are children Rachel C. (who I believe is from William's first wife Catharine) and Louis W. (who is probably from his second wife Rachel). Phew! Oh, and I'm prepared to bet that the full given names of the children were "Rachel Catherine" and "Louis William". 1850 CENSUS TRIVIA: If you ever look for any of these children in the census index, or look for any other Henry County child, be aware that the indexer for Henry County thought that nearly all the children that lived there were born in Iowa. That's because he saw the abbreviation "Ia", and applied the modern interpretation of "Iowa", rather than the 1850 census writer's intent that "Ia" stood for "Indiana". Also the indexer had trouble with census taker's messy use of ditto marks in the above Anderson household. Charlotte, Terrel and Margaret are indexed as "Spaw", rather than "Anderson". Only Nancy's 5 children should be named "Spaw". MORE CEMETERY RECORDS: Once the names and spouses in the 1850 census were known, I could go back to www.hcgs.net and search cemeteries again. 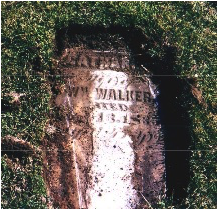 We find Mary Ann (Walker) Anderson and her sister Rebecca (Walker) Anderson are buried together in the Dunreith Cemetery, in the Anderson plot. Mary Ann died 10 Jun 1848, age 27y, 3m, 26d (that makes her birth date 15 Feb 1821). Rebecca died 10 Mar 1849, age 21y, 1m, 13d (birth date thus 25 Jan 1828). Buried near them is Delana Adline Anderson (1845-1929), Mary Ann's daughter. (We learn from census and other records that Delana was never able to support herself, for unknown reason. She lived with father Nelson and stepmother Nancy until they died, and then she was admitted to the Henry County Pauper's Asylum in 1900. She was still there in the 1920 census. LOSS OF CHILD RACHEL C? I believe that some time before 1855 the youngest daughter, Rachel C., may have died. The reason is that in a probate document discussed later, she is NOT listed as a survivor of William, who died in 1855 (see below). Also I cannot find any evidence of a "Rachel" of the right age in the right location in the 1860 census. William and Catharine had six daughters, but only the second youngest one survived long enough to raise a family. On ancestry.com, I found the family tree of Sarah Elizabeth Walker. However that tree had nothing on William and Catherine except their names. Sarah Elizabeth Walker was born 4 Mar 1831. She married Harvey Treble Sapp on 4 Sep 1852. They spent their lives in Indiana, and had 4 children. She went by the name "Eliza", and is found in the 1870 census along with Harvey. Also Harvey and Eliza "Sopp" are found in the 1880 census for Rush County (on the same page as Rachel Walker). Harvey died in 1882, and Eliza is found in the 1900 census, living with her son-in-law Jacob Parrish. In 1910 she is living with a different son-in-law, William Dora. She died 16 Mar 1913 in Rush Co., Indiana. THE DEATH OF WILLIAM: I had trouble pinning down exactly when William died. I had two Walker burial sites, but neither clearly had William's marker. However it turned out that Henry County, Indiana, has a very active group of volunteers working on preservation of gravesites and Internet publication of old records. I posed a question, and three people came to my aid. My thanks to Donna Tauber and Thomas Hamm of the Henry County Cemetery Commission and to U. E. Bush of the Henry County Genealogical Services. They reported that the Henry County Probate Order Book 1, page 107, indicated that letters of administration on the estate of William Walker were issued on June 27, 1855. This suggests William died in June of 1855. William died without a will. There were a few probate and guardian hearings, spread over 10 years. Terrel Anderson was appointed guardian of Ama (see above). The land remained in the hands of the family for a while. There were originally 160 acres, per the 1857 atlas of Henry County. Part of this (120 acres) was sold by son Jesse J. Walker and his wife Susanna on Jan 6, 1858. The remaining 40 acres remained in the hands of wife Rachel at least through 1875. Also at some point son-in-law Nelson Anderson apparently bought back the 40 acres next to Rachel. 1860 CENSUS, FRANKLIN TWP, HENRY CO.
Rachel is clearly found in this census, but she is head of household and William is gone. Son Louis is age 22, and "Amy" (Ama) Anderson (see above) is 11. Rachel owns the farm worth $1200, and has personal estate worth $400. Lewis, however, is the "farmer" of the family and owns $300 of real estate. Rachel is living very near Clarissa Kimbrel, and Hart Kimbrel, who were named in 1850 as being the spouse and child of Joseph Kimbrel. See also 1840 census. This suggests a strong relationship between the Kimbrels and the Walkers? I really think Rachel was also a Kimbrel, either by birth or by marriage! Once again Rachel Walker (indexed as "Wacker") is found. Louis is still at home and age 32, but he appears to have married �Jane� who is age 25. Rachel owns all the real estate worth $1600, and she still cannot read or write. Lewis owns only personal estate worth $800, but he is still the "farmer" of the family. 1880 CENSUS, WASHINGTON, RUSH CO., IN: Once again, they are all found – but they're now in neighboring Rush County. Lewis is the head, Jane is his wife, and Rachel is his mother. Lewis is the farmer, Jane is keeping house, and Rachel (age 80) is unemployed. Rachel reports her father was born in NC, her mother in VA.
Elizabeth M.; Birth Abt. 1826; Death June 15, 1849; Age 23y. ; D 0f W. & G.
I suspect that the inscription for Elizabeth (above) is really "D of W. and C.", that she was the daughter of William and Catharine. Catharine was William's first wife, who died in 1835. As noted earlier, Catharine and another daughter of William died in 1835, and were buried on the family farm. See earlier notes. But while William did not die until 1855, there was a stone on the farm with William's name on it. Did he decide he wanted to be buried with his first wife after all? Or perhaps the date question marks on the farm marker mean that it was placed at the time of Catharine's death, in anticipation of William's ultimate burial, but William was never actually buried there so nobody carved in the final date? If that is the case, where is William? Perhaps the transcription for Dunrieth Cemetery is simply not complete? "(Catharine Walker's) burial site is out in the middle of a corn field on the Gillespie farm. I was there in the 1990s and talked to Mr. Gillespie, or a member of his family, about the Walker burials. They took me and showed me where the stones used to be and then took me to the location in his front yard where they are now located. We uncovered the stones, which were under about four inches of soil. I have never come across any definite proof that William is buried there. I was just out there about two months ago getting a GPS reading for our database. I personally feel that William may be buried at Dunreith, as you mention. The Dunreith cemetery, the church records, and most of the town of Dunreith were nearly destroyed by a train wreck in the 1960's, and many of those stones were destroyed, never to be replaced." A FINAL PROBATE DOCUMENT: Returning to William, our Henry Co. Volunteers offered pages copied from "Probate Order Book 12, p. 259-263". It deals with an 1865 sale of land from William's estate, and contains the quote "�said decedent left surviving him his widow Rachel Walker, Jesse J. Walker, Bartlett Y. Walker, Richard B. Walker, Lewis W. Walker, Valinda Anderson, Delana A. Anderson, Anna (Ama?) Anderson, and Louisa Sapp wife of Harvey Sapp." "Widow RACHEL" is clearly the second wife of William. JESSE is William's oldest son. We found his name in an earlier land sale discussed above, and that sale showed his wife was Susanna, and their names together are found in the 1850 census for Rush Co., Indiana. That census says Jesse J. is age 32, and we now finally know both his name and that he was born in 1818 in North Carolina. BARTLETT, of course, is our ancestor. Note, however, this is the FIRST official document I have seen which PROVES William is his father. My examination based on vague references and circumstantial evidence was correct! LEWIS is found in all censuses from 1840 to 1910. Everything indicates that he was William's son by his second wife Rachel. VALENDA AND DELANA ANDERSON are William's granddaughters, by his deceased daughter Mary Ann, who married Nelson Anderson. See earlier discussion. AMA (ANNA?) ANDERSON is William's granddaughter by his deceased daughter Rebecca, who married Terrel Anderson. See earlier discussion. ELIZA (incorrectly transcribed as Louisa) is William's youngest daughter, Sarah Elizabeth, who survived until 1913. MISSING from the list of heirs, in addition to Mary Ann and Rebecca, are the following: There was another son in the census counts, for whom we have not found a name - - he would have been born about 1823 and must have died after 1840. There was Nancy, who as noted earlier died in 1835 at the age of 12 and is buried on the family farm. And there was Elizabeth M., who as noted earlier died in 1849 at the age of 23 and is buried in Dunrieth cemetery. Also absent is "Rachel C", who was alive in 1850, but apparently deceased by 1855 or 1865. See notes with husband William Walker. See notes with husband William Walker. Best guess is that she was the sister of first wife Catharine, but this is not proven.